Spider-Man is busy at the moment! 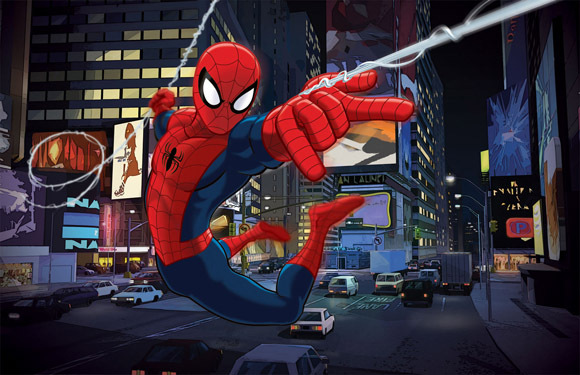 Not only does he have a brand new film coming out in the cinemas but he’s also in a brand new animated series on Disney XD called Ultimeate Spider-Man. Every Thursday at 4.30pm,watch the adventures of 16-year-old Peter Parker who has the difficult balancing act of saving the world from evil villains while attending Midtown High School. In the show Peter still hasn’t got to grips with his powers and so when S.H.I.E.L.D. Director Nick Fury offers Spidey the chance to hone his skills and train with the best, he accepts the opportunity in order to accomplish his goal of becoming the Ultimate Spider-Man. There he teams up with four other teenage super heroes, who all have to learn how to work together to defend the Marvel Universe.